Recombinant fragment within Mouse GAPDH aa 100 to the C-terminus. The exact sequence is proprietary. Our Abpromise guarantee covers the use of ab181602 in the following tested applications. WB 1/10000. Detects a band of approximately 36 kDa (predicted molecular weight: 36 kDa). IHC-P 1/2000. Perform heat mediated antigen retrieval with Tris/EDTA buffer pH 9.0 before commencing with IHC staining protocol. Has both glyceraldehyde-3-phosphate dehydrogenase and nitrosylase activities, thereby playing a role in glycolysis and nuclear functions, respectively. Participates in nuclear events including transcription, RNA transport, DNA replication and apoptosis. Nuclear functions are probably due to the nitrosylase activity that mediates cysteine S-nitrosylation of nuclear target proteins such as SIRT1, HDAC2 and PRKDC (By similarity). Glyceraldehyde-3-phosphate dehydrogenase is a key enzyme in glycolysis that catalyzes the first step of the pathway by converting D-glyceraldehyde 3-phosphate (G3P) into 3-phospho-D-glyceroyl phosphate. Carbohydrate degradation; glycolysis; pyruvate from D-glyceraldehyde 3-phosphate: step 1/5. Belongs to the glyceraldehyde-3-phosphate dehydrogenase family. S-nitrosylation of Cys-152 leads to interaction with SIAH1, followed by translocation to the nucleus. Cytoplasm > cytosol. Nucleus. Cytoplasm > perinuclear region. Membrane. Translocates to the nucleus following S-nitrosylation and interaction with SIAH1, which contains a nuclear localization signal (By similarity). Postnuclear and Perinuclear regions. Immunocytochemistry/immunofluorescence staining of 4% paraformaldehyde fixed; 0.1% triton X 100 permeabilized HeLa (human cervix adenocarcinoma) cells labeling GAPDH with ab181602 at dilution of 1/500. The secondary antibody used was Alexa Fluor® 488; goat anti-rabbit IgG (ab150077) at a dilution of 1/400. 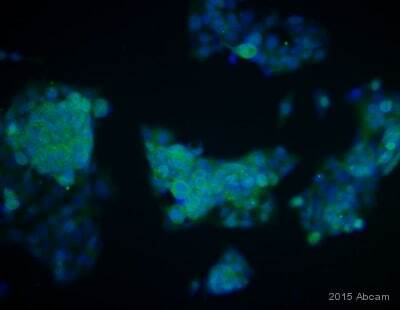 Nucleus was counter-stained with DAPI (blue). ab7291, a mouse anti-tubulin antibody (1/500) was used to stain tubulin along with ab150120 (AlexaFluor®594 goat anti-mouse secondary, 1/500). The negative controls are shown in the bottom middle and right hand panels- for negative control 1 primary antibody (ab181602; 1/500) and secondary antibody (ab150120; 1/500) was used. For negative control 2 primary antibody (ab7291; 1/500) and secondary antibody (ab150077; 1/400) was used. Immunohistochemical analysis of paraffin-embedded rat spleen tissue labeling GAPDH with ab181602 at 1/2000 dilution, followed by prediluted HRP Polymer for Rabbit/Mouse IgG. Nucleus and cytoplasmic staining on lymphocyte of rat spleen is observed. Counter stained with Hematoxylin. Negative control: Using PBS instead of primary ab, secondary ab is prediluted HRP Polymer for Rabbit/Mouse IgG. GAPDH was immunoprecipitated from 1mg of HeLa (Human epithelial cells from cervix adenocarcinoma) whole cell extract with ab181602 at 1/60 dilution. 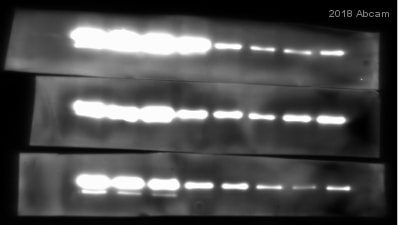 Western blot was performed from the immunoprecipitate using ab181602 at 1/5000 dilution. Anti-Rabbit IgG (HRP), specific to the non-reduced form of IgG, was used as secondary antibody at 1/1500 dilution. Lane 1: HeLa whole cell extract. Lane 2: PBS instead of HeLa whole cell extract. Blocking and dilution buffer and concentration: 5% NFDM/TBST. Flow cytometric analysis of 2% paraformaldehyde-fixed Jurkat (Human T cell leukemia cells from peripheral blood) cells labeling GAPDH with ab181602 at 1/180 dilution (red) compared with a rabbit monoclonal IgG isotype control (black) and an unlabeled control (cells without incubation with primary antibody and secondary antibody; blue). Goat anti rabbit IgG (FITC) at 1/150 dilution was used as the secondary antibody. Immunohistochemical analysis of paraffin-embedded human transitional cell carcinoma of bladder tissue labeling GAPDH with ab181602 at 1/2000 dilution, followed by prediluted HRP Polymer for Rabbit/Mouse IgG. 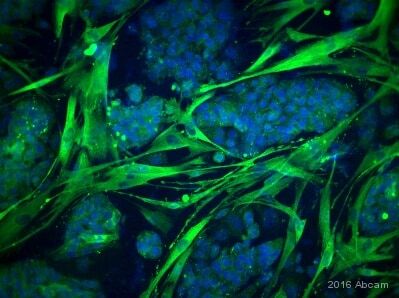 Cytoplasmic and nucleus staining on the tumor cells of transitional cell carcinoma of human bladder is observed. Counter stained with Hematoxylin. Immunohistochemical analysis of paraffin-embedded mouse spleen tissue labeling GAPDH with ab181602 at 1/2000 dilution, followed by prediluted HRP Polymer for Rabbit/Mouse IgG. Nucleus and cytoplasmic staining on lymphocytes of mouse spleen is observed. Counter stained with Hematoxylin. Publishing research using ab181602? Please let us know so that we can cite the reference in this datasheet.